Vipers Hiss through Miami –or-- You don’t know what you’ve missed until you find it again…. It’s always fun to rediscover something that you’ve missed for a while. This was certainly the case with our return to Miami the first week of March for what can only be described as the best regatta of the year. As the Viper Class did not attend the Bacardi Invitational Regatta last year, 2019 saw a welcome return for the class to this legendary event. It’s not often that we plan to spend 8 days in one place, hoping to sail every day. Returning to Coconut Grove, FL, with its lush tropical gardens, quiet residential streets in the Old Grove, and vibrant night life, raised the sense of expectation. Nothing beats walking to the US Sailing Center or Shake-A-Leg to rig your boat in 80 F sunshine on the first morning and seeing a steady 12-15 kt. breeze on Biscayne Bay. We chose to alter the schedule a bit, having a fun tune-up on Sunday, March 3, followed by two days of racing for the Viper Winter Cup. 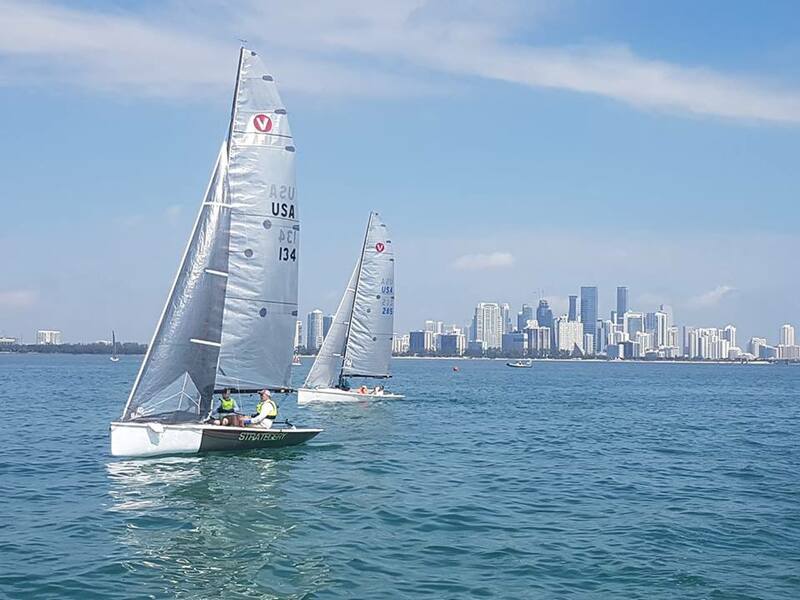 A special thanks goes out to Dan Tucker and his daughter Dana for making a the trip to Miami to be our Race Committee, with help from Beenie McNeill and Pat Downey at the US Sailing Center we had a first class event. With 10 boats racing, after 7 good races. Bill and Joanne Abbott with Scott McNeill won the Winter Cup despite missing the first race. Viper Winter Cup 2019 Results HERE. On Wednesday, the famous Scorch to the Boaters Grill in No Name Harbor on Key Biscayne was as it should be – a spinnaker blast in sunshine across Biscayne Bay with the winners clocking 16.3 kts of boat speed! Lots of beer and a buffet lunch followed with a LeMans start to head back, a lovely fetch with lots of spray to keep us focused. Wednesday evening was registration and our first real chance to enjoy the Bacardi bar. Live music and good food rounded out a classic Miami day. Thursday was the start of the 3-day Bacardi Cup Invitational. After day one, the boys from California were out to show they are ready for the Worlds in Long Beach this coming year. Geoff Fargo with Jon Bell and Spencer Steffen lead the day after 3 races and Ed Feo with Keith Magnusun and Phil Toth only a few points behind. The youth sailors from Gulfport had won the respect of everyone on the course (and so well behaved. “Is that enough room to round, ma’am?”). After three more races on Friday, Geoff Fargo was still leading but Mary and Geoff Ewenson with Tyler Bjorn were hot on their heels. With two bullets on the final two races Saturday, The Ewensons on Evil Hiss won the event. 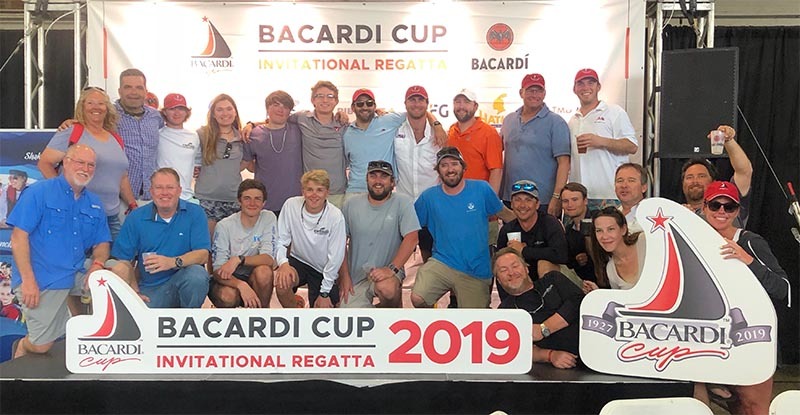 Bacardi Cup Invitational Regatta 2019 Results HERE. The consensus was that Bacardi had masterfully organized the event, Miami is still a great destination event and that the Viper 640 should continue to make this one of the best weeks of sailing we have all year. 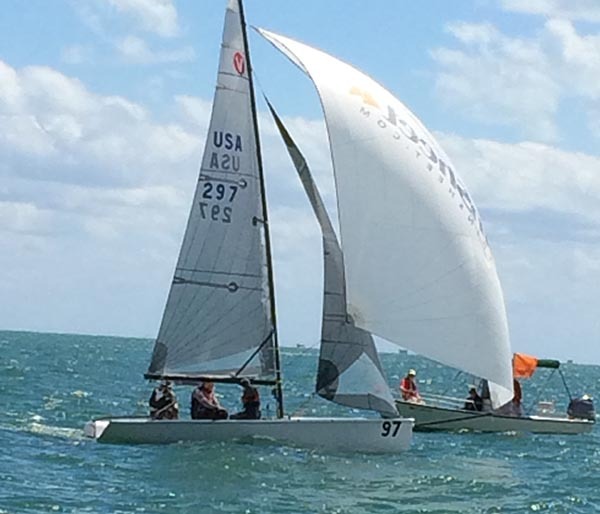 Two dozen sailors from the Gulf Yachting Association taking a bow at the conclusion of the 2019 Bacardi Cup Invitational Regatta.